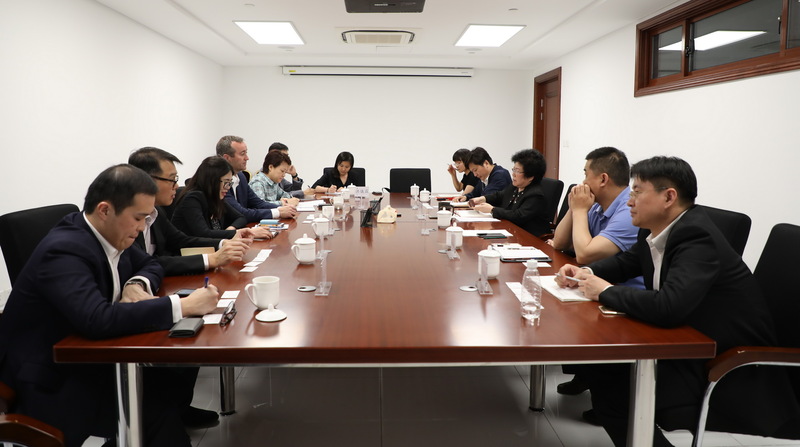 On the afternoon of May 21, Chen Wenling, Chief Economist of CCIEE met with Mr. Pierce SCRANTON, Executive Director of the Institutional Relations at Temasek, Mr. Cai Youren, and Ms. Gu Yanfei, Managing Director, China (Beijing Chief Representative) at Temasek. Researchers of the Strategic Research Department of CCIEE were also present at the meeting. The two sides exchanged views on the current Sino-U.S. trade issues and the Sino-Singapore cooperation under the framework of the Belt and Road initiative. Chen Wenling pointed out that Sino-U.S. relations not only concern China and the United States but also affect the overall development of the world. A good bilateral relationship will benefit both nations and vice versa. The joint statement on economic and trade issues released recently by China and the United States indicates that the Sino-U.S. economic and trade issues will be resolved through dialogues instead of confrontation in the future, which will open a new chapter in the Sino-U.S. dialogue. The key to resolving the trade conflicts between China and the United States lies in the change of thought because mentality determines solutions. The change of mentality will create a new miracle in the Sino-U.S. cooperation from five perspectives. First, the US should relax its exports of high-tech products. Second, the two countries should jointly promote the digital economy, including trade in digital products, E-international trade, and also the circulation of open data. Third, we must accelerate the negotiation on the China-US Bilateral Investment Agreement (BIT). Fourth, the two nations should strengthen cooperation on the Belt and Road, including cooperation on infrastructure investment and the development of third-party markets. Lastly, they should push forward the FTA. Mr. Pierce SCRANTON said that China is the world’s most promising market and this is not only true for the United States but also for all countries in the world. In the future, the two countries should think about how to expand bilateral economic and trade relations and build economic and trade relations that are most conducive to the two countries and the rest of the world. From the perspective of enterprises, he hopes that the Chinese market will be more open and is looking forward to witnessing the further implementation of China’s structural reform.